It’s 2019 and this means new beginnings, new influences, and new trends. Not only will we dive into global trends, we will also talk about how trends will come into play and develop locally here in Miami. While many of the styles we see will continue to be popular in 2019, others are officially over. Whether you are renovating or buying a workspace, retail space or hospitality space, here are a few essential tips and trends to get you going in the right direction. For the past couple of years, we have seen staple trends such as cool grey walls with dark stained wooden floors or all-white, hyper modernistic design that seems to be taking over every home, lobby, and professional workplace in Miami. These widely spread trends will still have a place in certain interior spaces, but people are now exploring a more out-of-the-box approach to design. We are now beginning to see a diverse and colorful side in 2019. People want their environments to be a reflection of who they are, opposed to having an interior that looks as if it was pulled straight out of a catalog. There are many things that influence trends, but we believe that one of the principal drivers for instinctual design is people’s reaction to the current political climate. Individuals are gaining a sense of confidence in their own voice and we are seeing that take form in many ways especially in design. To the same point, due to all the challenges happening even on a global level, art and design has become a medium in which people can spread optimism and hope for the future. Happiness never goes out of style and people want to be surrounded by things that make them happy. We are shifting further away from stuffy, intimidating interiors and leaning more towards spaces where you can let loose and be more yourself. Candy artist Robyn Blair Davidson is one of our favorite designers who personifies whimsical design. 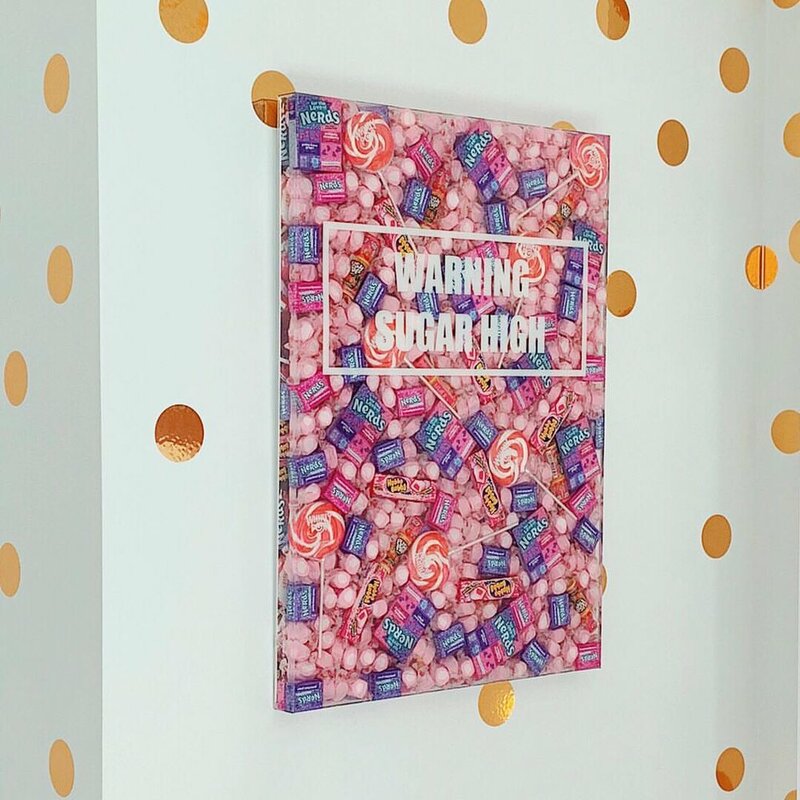 Her pieces literally sweeten up any space with her bright fonts, textures, colors, and last but not least CANDY! What’s there not to love about that? We are seeing street style EVERYWHERE. Over the past ten years, Miami has had a massive increase of development leading to the gentrification of many underdeveloped areas. What used to be a “not so friendly” area of Overtown/Midtown is now a creative hub and home to many local and international artists. Miami’s unique up and coming personality has heavily influenced artists. Creating a rich, vivacious and daring artistic scene. For example, we see the blending of graffiti with something more feminine and traditional, which makes it all the more exciting and is easy to incorporate into many different design styles. Street style is direct representation of our current narrative serving as a nod to the past and a step into the future. It keeps us connected to our rich history while giving us the opportunity to put in our own creative mark. Let’s face it, as much as we love to call Miami home, it’s safe to say that the cost of living comes at a hefty price. To compensate for the rise in cost per sq. ft. people are gravitating towards smaller, more affordable, urban city-like dwellings. 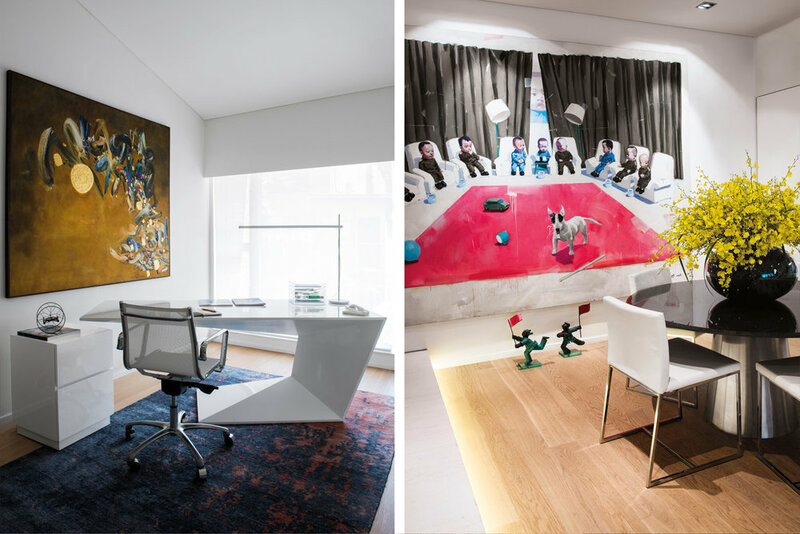 As designers, we are now faced with the challenge of smaller, open concept spaces where we need to be creative and utilize multipurpose furnishings. Furniture is now becoming slightly smaller in scale but adaptable to different spaces and needs while maintaining a stylish aesthetic. We are seeing a lot of features such as modern approaches to Murphy beds to movable walls and multipurpose built-ins. Design is slowly shifting towards creative innovation and efficiency. It is exciting and very interesting to see design that sparks a conversation and makes the best of even the smallest spaces. Not only in 2019 but from here on out, designers and consumers should always go green. With Miami’s increasing sea level rise crisis and our planet’s environment suffering major crisis after major crisis, it is imperative to explore new ways to produce materials that are easy on the eyes while leaving no impact on our planet and it’s resources. Thanks to advanced technology and research, there are so many eco-friendly alternatives we can utilize to achieve the same beautiful results we desire. Alternatives such as hemp-based products replacing concrete, left over materials like marble being recomposed in smart ways, energy saving appliances, and fully solar powered homes and building are some ways we can better our planet. The possibilities are endless and there are so many ways we can take less and give back more to our environment. Living Coral was announced as the Color of the Year 2019. With Miami’s coastal lifestyle, this fun bright hue can be used in many ways. This color is vibrant, refreshing, optimistic, and pretty much embodies what Miami is all about. You can infuse living coral into a space with accessories, wall art, textiles, wall coverings even furniture pieces serving as a fun accent piece. If you want to experience year-round warm weather, beautiful beaches, and all the finest ocean front luxuries you can possibly ask for, look no further and treat yourself to a beach getaway in Miami. Visitors and locals love the beach life so much that we see more and more clients requesting luxury hotel amenities in their very own backyards. People are now asking for their backyards to feel like the One Hotel’s nature inspired ambiance, or Soho House’s art deco beach vibes to name a few. They want amenities such as over sized cabanas, outdoor theaters, poolside televisions, and pizza ovens from Italy. Greenery such as synthetic sod which is prevalently used on hotel pool decks are now being used in home landscaping because it always looks perfect and doesn’t require water or chemicals to keep it healthy. It’s a great concept and who says you can’t enjoy the finer things in life in the privacy of your own home. Color blocking has been found time and time again in design and its officially back. The good news is, all you need to achieve this look is a few paint colors, and some painters tape. We have especially been seeing a lot of color combinations in the Neo- Memphis style. Neo- Memphis style started in the 1980’s and was basically a design movement that was influences by Art Deco’s appreciation of striking geometric figures and pop art’s evident use of bold color palettes. This is a fun and simple way to fully transform a dull area into something captivating and will get you inspired to bust out your paint brush and rethink the way you paint a space. Curves are back and hopefully here to stay. In the 1960’s the use of curved, organic forms was very popular but soon overshadowed by modern linear designs that came into play in the 70’s and 80’s. Since then, it feels that rigid lines have taken over for the past several decades and I think we are finally ready for a change. Curved shaped lines adds a subtle sense of sensuality and eclecticism that breaks away from an overly structured interior. When styled correctly, this look is very unassuming and saves it from being an of-the-moment fad soon to fade away. In 2019 , you can expect to see curved lines and shapes on tabletops, rugs, sofas, and other seating alternatives. Grey tones for the most part have been the go-to neutral color spectrum and we are beginning to see a little bit less of that. Although it is a great color because if feels open, airy, and soothing, people are starting to gravitate towards bolder colors to pull different emotions and create more diverse ambiances. Color heavily impacts our mood and end users are becoming more aware of that so if the function of the space is meant to be energized, color selection will be dictated by the functionality of space versus what may just look visually appealing. Another great example is using color mono-chromatically. Deep rich rooms in the same color spectrum creates a lot of natural light and luminescent hues. We hope you enjoyed learning about some of our favorite trends and hopefully you can apply some these design elements in your own space!